Rain of Fear is EverQuest's nineteenth expansion pack! This expansion brings players 14 new zones to explore. Players are now able to reach the 100th level. Go from level 95 to level 100 - A huge milestone for EverQuest, level 100 is now obtainable! Hunter System - Gain special rewards and titles for defeating large numbers of foes. After defeating a large number of a specific type of NPC, you are granted a "Banestrike" ability. This ability is usuable once every 1 minute, and will hit your target for some direct damage. This ability will only work on types of NPCs you have mastered killing. 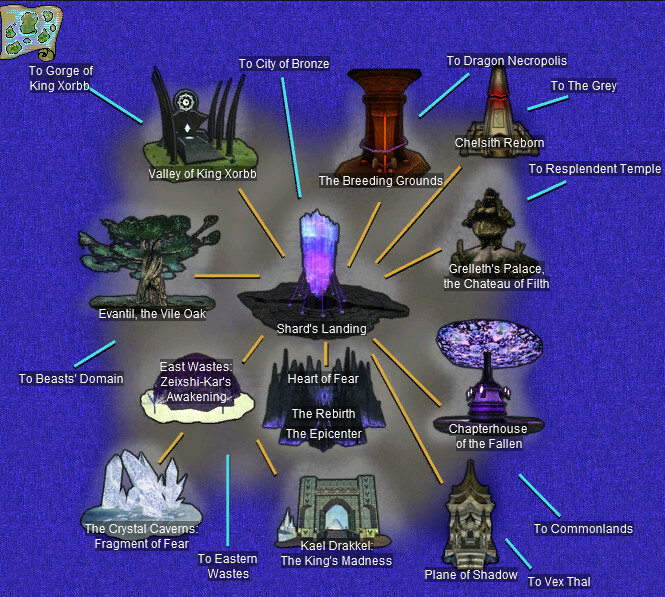 Collection System - Discover items throughout Norrath and collect sets for exciting rewards and titles. Collection items appear as ground spawns and as drops from NPC's in all Rain of Fear zones. Collecting all pieces of a collection quest will grant great rewards! Improved Brokering System - Sell items in the Bazaar while being offline! More flexibility as a buyer to search and purchase from anywhere in the world. Check out a quick video overview of this feature Here! More than 110 Quests - Challenge your skills and gather useful loot. 21 Raids - Collect valuable rewards from all new adventures. New Cursed Temple of Veeshan lets you relive the old days of Dragon slaying! 14 Zones - Be the first to discover untouched lands of Norrath. 25 Missions - Experience intriguing lore and immersive Missions. The entry zone for Rain of Fear is Shard's Landing. The zone in for Shard's Landing can be found in Erillion, City of Bronze.. We have also prepared a video overview of the Shard's Landing zone, which shows the location of the Rank 1 spell vendors, the armor materials vendors, and the zone lines found in Shard's Landing. This video can be found Here. Rain of Fear does not have any group flagging. All zones are open on day 1. All spells and AA's are also unlocked on day 1. The only real progression achieved from doing quests and missions in each zone is the ability to request the raid for that zone.